Delta College Public Radio serves the Great Lakes Bay Region of mid-Michigan. Our programming consists of Morning News & Inforamtion Programs and afternoon music programs. Local music productions are the heart and soul of our operation. 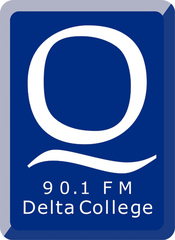 Delta College Public Radio receives support from Delta College, Community Underwriters & Day Sponsors & Listener donations. There are No federal or state funds involved in our operation.